After winning the Old Dominion Athletic Conference (ODAC) Tournament Sunday, the men’s lacrosse team will host a first-round NCAA Division III Tournament match-up at 7 p.m. on Wednesday against Sewanee (Tenn). 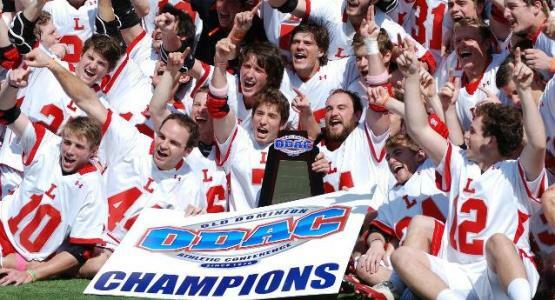 Lynchburg enters the tournament with a 16-4 record and earned the ODAC’s automatic NCAA bid after defeating Hampden-Sydney College earlier Sunday 21-13 in the conference title game. LC is riding a nine-game winning streak, dating back to early April. Lynchburg won two NCAA Tournament games in 2013, defeating St. Mary’s (MD) and Roanoke Colleges before losing to eventual champion Stevenson University. Sewanee enters the postseason after winning back-to-back Southern Athletic Association Regular Season Championships. The 12-4 Tigers earn their second-straight NCAA Tournament bid. The winner of the LC/Sewanee contest will face the winner of Washington College (MD) and Eastern (PA), hosted by Washington College. In the championship game, sophomore attack Austin Stewart posted seven goals. It is the fifth ODAC title in program history and the second in the last three seasons. Read more about the championship game.